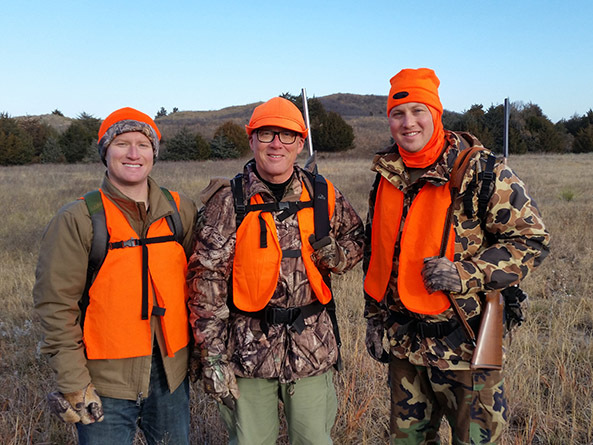 Above: Sen. John Arch with his sons Cameron, left, and Nicholas, right, on a deer hunting trip near Valentine in 2017. In November, Sen. John Arch of La Vista stepped down as director of the Boys Town National Research Hospital in Omaha after 25 years there. For the previous decade, he had been seeking a “broader platform” from which he could help not only the children and families served by Boys Town but all of Nebraska’s residents. After consulting with former Sen. Jim Smith of Papillion—his predecessor in the District 14 seat—and others, Arch decided that the Legislature could be that platform. “I began to realize immediately that health care was one of the best training grounds for the Legislature because … the issues are complex and there are many interest groups that have to come together to take good care of patients,” he said. Arch grew up in Sioux City, Iowa, the son of a switchboard operator and an engineer. He knew early in life that he wanted to work with people, and he studied the Bible, history and philosophy at Grace University in Omaha with the goal of becoming a pastor or a missionary. Arch found himself drawn instead to a theology and psychology master’s degree program at Western Conservative Baptist Seminary. After graduating in 1980, he and his wife, Brenda, moved to Papillion, where Arch worked as a counselor through a local church. A growing interest in business inspired him to earn an MBA from the University of Nebraska at Omaha in 1987. Later that year, his counseling experience and business acumen landed him a job at the St. Joseph Center for Mental Health in Omaha. It was while working there that he met Dr. Patrick E. Brookhouser, the founding director of the Boys Town National Research Hospital. Brookhouser asked Arch to be the hospital’s administrator in 1993, and Arch took over as director when Brookhouser died in 2011. As administrator, Arch focused on building trust and relationships, a practice he plans to continue as a senator. As might be expected of someone focused on relationships, Arch said that the best part of his new job has been meeting fellow senators, some of whom have not fit his preconceptions.